monitor the impact and effectiveness of interventions and strategies and ensure they are effective. (WHO, 2008; Ward, 2010). hotlines (Council of Europe, 2000). However, obtaining accurate data on VAWG in conflict and post-conflict settings presents obvious difficulties given security and logistical constraints, high mobility of people, reluctance of individuals who have suffered profound trauma to report, poor infrastructure, and lack of confidence in existing services (WHO, 2008). In these settings, SOPs can serve as a basic tool in establishing standards for safe and ethical data collection and data sharing. However, information in the SOPs about standardizing data collection and analysis across service providers is relatively limited. 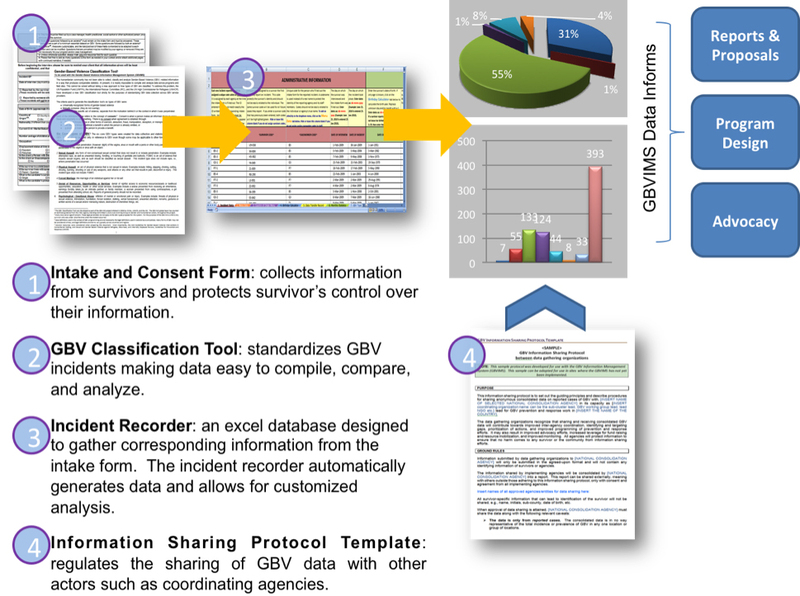 In order to introduce safety and ethics into data collection, and to address the challenges that limit the availability of service delivery data in humanitarian settings, an initiative to develop a standardized data collection and analysis mechanism was launched in 2006 by UNOCHA, UNHCR, and the IRC: the Gender-based Violence Information Management System (GBVIMS). Today, the GBVIMS is an inter-agency initiative governed by a Steering Committee made up of representatives from UNHCR, UNFPA, IRC and UNICEF. is easy to deploy because it uses Microsoft Excel. GBV Classification Tool: a set of six types of GBV to standardize GBV definitions and the incident classification process. Intake and Consent Forms: collects information from survivors and protects survivor’s control over their information. The ‘Intake and Initial Assessment Form’ is a standard intake form designed to ensure that actors are collecting a common set of data points. The ‘Consent for Release of Information Form’ requires survivors’ authorization for any of their information to be shared; it is intended to ensure that the rights of the survivors to control their incident data are maintained and protected. Incident Recorder (IR): an MS Excel database designed to simplify and improve data collection, compilation and analysis. GBV Information Sharing Protocol Template: a protocol template that outlines guiding principles on the safe and ethical sharing of VAWG data and best-practice to follow when developing an inter-agency information sharing protocol. The GBVIMS has been implemented in Burundi, Colombia, Cote d’Ivoire, Democratic Republic of Congo, Ethiopia, Guinea, Iraq, Kenya, Liberia, Nepal, Sierra Leone, Southern Sudan, Thailand, and Uganda. Enhanced Programming Resulting from the GBVIMS: GBVIMS data helps shape programs by informing program staff about acts of violence, survivor and perpetrator profiles, and gaps in service provision. This helps service providers and coordinating agencies adapt prevention programming and response activities based on data from reported violence. GBVIMS data helps: inform programmatic decision-making for individual service providers and inter-agency working groups, bolster advocacy efforts (i.e. policy development and fundraising), and facilitates donor reporting. In South Asia, data from the GBVIMS showed an increase in reported cases of sexual violence. Data also revealed sexual violence survivors were not reaching the health clinic within 72 hours. In response, a campaign was developed to inform the community about the importance of health services (for all GBV survivors) and how to access them. In East Africa, data from the GBVIMS was used to dispel myths that sexual violence was committed primarily by strangers. The service provider showed that over 60% of survivors reported that the alleged perpetrator was someone they knew and the act of violence had been committed in locations that were assumed to be safe. This helped their advocacy at the coordination level. In East Africa, GBVIMS data showed frequent reporting of sexual violence incidents that were committed in the school environment. Data showing this predominance helped the service provider gain access to local schools to raise awareness of GBV and inform school officials about available services. Then the service providing organization advocated for the creation and implementation of codes of conduct for teachers/administrators regarding GBV. Submit a brief questionnaire to the Steering Committee to ensure that it is applicable to the your context and programmes of the requesting organization. Participate in a consultation with a member of the GBVIMS Global Team. This provides access to the expertise of organizations that developed the GBVIMS and have implemented the GBVIMS in multiple countries. See more information on the GBVIMS website. Watch a short GBVIMS Website Tour in English. Reporting and Interpreting Data on Sexual Violence From Conflict-affected Countries: The “Dos and Don’ts” (UN Action, 2008). Available in English. WHO Ethical and Safety Recommendations for Researching, Documenting and Monitoring Sexual Violence in Emergencies (WHO, 2007). Available in English.